The cell phone bill came in. It was a little higher than usual, not by much, but enough to get me looking for the reason why. I consider the cell phone bill a fixed expense. Technically, it’s not since there is always the possibility that we could go over minutes at which point the charges skyrocket. I know this. Two teenage boys with their first girlfriends and, well, let’s just say they finally understood what I meant by girls can be expensive. But even so, we pretty consistently pay around $98/month, give or take a few pennies. So it’s a fixed expense in my budget. Both boys pay for their portion of the bill. John and I take care of the family plan charge which leaves the boys with their $10 extra line charge and $5 unlimited texting fee. That plus taxes and surcharges and the kids each owe me $17.04 monthly. It’s a steal, really. I located the extra charge. It was for $5.99 and showed up under Ryan’s portion of the bill. Ryan recently upgraded to a new phone. His second in three years. That’s what happens when kids have to pay for their own stuff. They discover that they really don’t need the whiz-bang latest technology. The old stuff works just fine, thank you very much. Since the rest of us were not charged this fee, I figured it had something to do with Ryan’s new phone. But instead of me picking up the phone to figure out what was going on, I decided it was time for Ryan to handle his own inquiries. He’s 15 and quite capable. He was also quite willing. Again, when you have to pay for your own stuff, a $5.99 charge is worth looking into. So he dialed the number and talked with the representative. Here’s what he found out: Apparently, out of the goodness of their hearts (it wasn’t in the contract), TMobile decided to enroll him in their insurance plan for his new phone. It was $5.99 a month and would cover the cost of a new phone minus the $40 deductible (he’s familiar with deductibles) should he lose his. He asked me what he should do. “Have you ever lost your phone before?” I asked him. I could tell he was thinking really hard about it. He had his old phone for three years and never lost it. He’d been scared that he had a couple of times, but we always found it. Besides, his new phone cost him $150 plus taxes. Minus the deductible, that would leave $110 that he was insuring at $6/month. He decided it wasn’t worth shelling out the additional money. He finished his conversation with the representative who reversed the charges for him. But the lesson is not over. When the next bill comes in, I’ll have him confirm that it was reversed. Dealing with this sort of thing is definitely not fun. It’s time-consuming and a hassle. But I’m thrilled that both boys are at the age where they are capable enough to handle these on their own. It puts them one step closer to being ready to go out in the world on their own…and do okay. Sort of a bittersweet moment for me. Ryan just bought a car. And she’s a beauty, too. 2002 baby blue Toyota Prius with only 57,000 miles. Owned by a 91-year old grannie who used it mostly to drive to church and back. No kidding. Problem is, Ryan can’t drive it; never mind he doesn’t have his license. He barely has his permit. And taking an online course to get his permit happened after he bought the car. How does a 15-year old with no permit end up with a pretty snappy car sitting at the bottom of the driveway? It starts with a plan. When Ryan was 11 years old he got his first job. He delivered papers once a week after school. Most of that money went directly into his savings account. Although he was responsible for all his discretionary spending, there wasn’t a whole lot he spent money on. John and I customized his interest rate (KidsSave was a great help in this area), so that the more he saved, the more he ended up with. This was a great incentive. But an even greater incentive was the offer his grandmother gave him. She would match him dollar for dollar on his first car. Over the years he added soccer reffing, teaching math centers, and yard work for our neighbor to his list of jobs. He also did the occasional lemonade and root beer float stand. Then there were his buys and sells on ebay. Again, most of it went into his savings account. Although I have to mention here, just in case you may think he never enjoys spending money, he bought his own $350 mountain bike, an ipod touch, golf clubs and other pretty pricey items. He knows when to save and he knows when to spend. But my main point is that, when you have a goal in mind, when you know what you want and have figured out the steps to get there, it’s easier to keep your eyes on the target. That’s the power of goal setting. It keeps us focused. Even when you’re eleven years old. Four years later the perfect opportunity presented itself. We live near a community college which doubles as a used car lot on the weekends. Nathan and Ryan, just playing around on the computer one day, discovered that a used Prius would be on the lot. A Prius is exactly what Ryan wanted. He’s my little eco-friendly kid. The stars seemed to be aligning for him. About six months ahead of when he had planned on buying a car, it was an opportunity not to be missed. An opportunity on a variety of levels. This was his first major negotiation and he wanted to do it himself. So John and I prepped him. He needed to know exactly what his maximum offer would be. Start low, move up. The owner, through her grandson, was asking $10,000. Ryan went in at $8800. They came back at $9200 which was exactly what Ryan had hoped. He had just made his first deal. After registration and taxes, the total came to $9796. Split with his grandmother, Ryan’s share was $4898. He paid in cash. 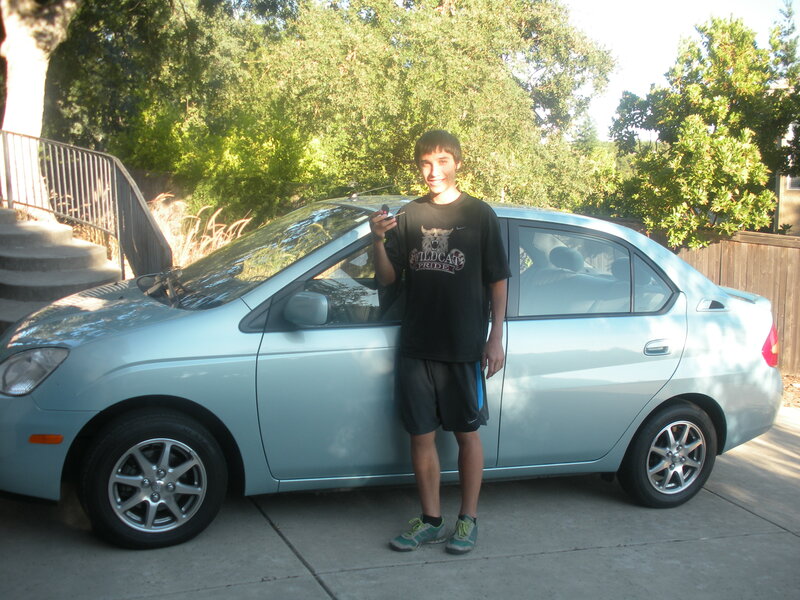 That’s how a committed 15-year old buys his first car. This is the first in a series of Kids and Money Quick Tips videos that I will be putting together. This first one is on getting kids in the habit of saving money. We all know that literacy, the ability to read and write, is an important life skill. It’s so important that we often create an environment at home to reflect this. We start reading to our kids from an early age, years before they know how to read themselves. We surround our kids with all kinds of reading materials from books, to magazines, to newspapers, to grocery lists. And then, to underscore the importance of reading even more, we read in front of them. Yup, we pick up the newspaper or magazine and absorb the words on the pages while our kids are watching. When they begin to read on their own, we ask them questions about the plot and characters. At school, monthly book orders are sent home and assemblies bring in authors who talk about how they write their books. We even reward kids with stickers on classroom charts or refrigerators at home reflecting pages read. It’s hard to grow up in an environment such as this and miss the message that reading and writing is important. The Money Connection: There’s another type of literacy which is just as important that isn’t quite as integrated into our environment. Financial literacy. Simply stated, financial literacy is the ability to effectively and comfortably deal with issues relating to money in a way that benefits us. It’s important for things such as budgeting, understanding credit, and investing. We need to be just as passionate about our kids learning financial literacy as we are about teaching them reading and writing literacy. But since financial literacy in the elementary and middle school curriculum is not where it should be, we’re going to need to do double-duty at home. Without obsessing about money, this simply means that we need to be aware of opportunities to sneak in a few life lessons. 1. Talk about money from an early age – how it is earned, how there is a limited supply, the importance of making good spending choices, how to be a good consumer, etc. 2. Just like a book is the tool we use to teach kids how to read, money is the tool we use to teach kids how to become good money managers. Give your kids money on a regular basis (an allowance is the most popular way) and then have them be responsible for their discretionary spending. 3. Create a list of extra jobs kids can do around the house to earn additional money. 4. Share your savings goals with your kids and have them create their own. 5. Have tweens and teens keep track of their spending in a registry so they get an idea of where their money goes as well as learn how to keep a running balance. 6. As an incentive to get your child to save, offer to match their savings dollar for dollar. 7. Always look for teachable moments, such as being out shopping, to tie in important money ideas. Kids learn to become good readers through reading. By the same token, kids learn to be good money managers through doing money. Providing your kids with money to manage and initiating on-going money discussions at home will help build the financial foundation so necessary for success in today’s society. So it happened again to me today, and it’s happened enough that I decided to write about it…and solicit your help. I was chatting with a woman I just met about this, that, and the other, when, inevitably, the question so what do you do? comes up. She’s a stay-at-home mom, nice, and I told her I was a kids’ personal finance educator. “You can teach personal finance to kids?” she, and just about everyone else, asks. Now don’t get me wrong. Until my youngest, Ryan, began to exhibit extreme carefree spending tendencies, the idea had never really occurred to me, either. At least, not beyond giving him an allowance. But if you think about it, setting up an allowance system is most definitely a form of personal finance. At least it should be. It’s not enough that kids get money. It’s important that we teach them what to do with that money. Things that we do with our own adult personal finances: save, spend, share, invest, borrow, budget. We need to do it in a way that gives kids real, hands-on experiences with their money so that they’ll get the practice they need before we send them out into the world. And the good news is, it’s not that hard to do. Even if you don’t feel “qualified”. And while we’re doing it, we need make ‘personal finance for kids’ a recognized phrase. So I’d love to have your help. It would be great if you could help spread the word about the importance of teaching kids money while they are still young. In addition, I want to be a resource for parents. My Raised for Richness Facebook page is filled with all kinds of tips and research studies. It’s a great place for parents to start. I am also working hard to make our website a resource, as well. We’ve included a bunch of free stuff recently. And then there are the Beyond-the-Piggy-Bank Challenges filled with the specific steps needed to begin teaching personal finance. I do these periodically and if you email me, I’ll get another one scheduled soon. So let’s start a movement! Let’s get the word out make ‘kids and personal finance’ just a regular part of our everyday language. Together we can make a difference. There was a huge graphic of a cell phone on the front page of the Sacramento Bee this morning. It was all about the love affair tweens and teens have with their cell phones confirmed in a study by Pew Internet and American Life Project. Parents have been handed an unbelievable tool to help teach their tweens and teens money management. The cell phone. Yup. That object of love and hate. Done correctly it becomes an object of learning. Here’s how. Teens need to stay connected to their friends. This is normal as they figure out their place in the world. Cell phones keep them connected. Using their “need” for a cell phone as the motivator, we can teach them basic money management skills such as budgeting, paying bills, and living within your means. First, tweens and teens need to know that along with a cell phone comes responsibility. Keeping track of your cell phone, resisting the temptation to text during dinner, and paying your phone bill. Kids paying bills? You bet! And the best time to teach them is while they’re still hanging out with you. At least you’re not going to turn the heat off on them! Next, it’s important to establish what part of the phone bill your child is responsible for. For example, you may pay the family plan fee but maybe your teen pays the additional phone line fee, texting, and any upgrades. If your child is old enough, you can even see if the bill could go go directly to her. If you haven’t set up an allowance yet, this is the time to do it. Most kids don’t have jobs so it’s important to get money in their hands for the purpose of learning how to manage it. You can tailor the amount of allowance based on the responsibilities that come with it. Now comes the fun part. Kids learn to manage their money in the context of something they love…their cell phone! Upgrades? They pay. Overages? They pay. New phone? They pay. Lost phone? They pay. Unpaid bill? No phone. See how simple it is? Okay, so it’s going to take a few months before everyone understands how the whole thing works, but when that happens, it’s a thing of beauty. Kids are happy; as long as they pay the bill, they stay connected to friends. Parents are happy; their kids are learning real life skills. It’s another win/win. You may even find that your kids become pretty savvy consumers. Just how important is it to have the latest phone with all the gadgets? When it’s their money on the line, the difference between needs and wants takes on a whole new meaning! And that got-to-have-phone may be the perfect time to introduce them to the idea of setting a financial goal. It’s true that some parents feel the peace of mind that comes with a cell phone is worth paying for the phone themselves. But wouldn’t you also want the peace of mind knowing that your child is ready to take on the financial challenges that await her out there? Don’t miss this silver-platter opportunity. With tweens and teens, they’re few and far between.